A new group of proteins called cytokines, critical for antimicrobial activity and repairing the damaged intestinal tissue found in inflammatory bowel disease (IBD), has been discovered by researchers in a study led by Georgia State University. 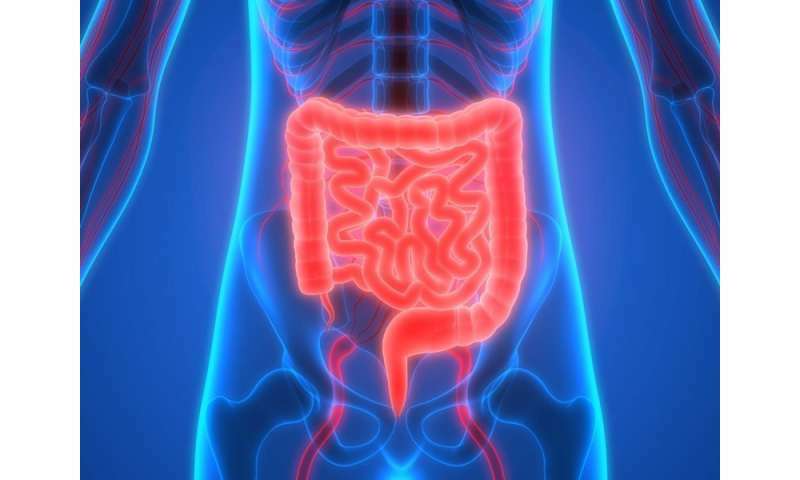 The research team examined acute intestinal disease in the colons of mice and found a specific network of proinflammatory cytokines was activated in response to intestinal barrier damage and instrumental in repairing the damaged tissue. Cytokines are small proteins that are produced in response to microbial threat and aid in the recruitment and activation of immune cells to protect the host. The findings, which have potential implications for the treatment of intestinal inflammatory conditions, are published in the journal Proceedings of the National Academy of Sciences. In the intestine, cells form a physical barrier that separates the body cavity from the outside environment and protects the host from microorganisms. However, damage to this barrier can activate immune cells, which promote repair and resolve inflammation. If the damage persists or repair processes are ineffective, chronic intestinal inflammation occurs, as found in human IBD, resulting in abdominal pain, persistent diarrhea, rectal bleeding and other symptoms. "In this manuscript, we identified a novel cytokine network involving IL-36γ, IL-23 and IL-22 as being involved in the repair of intestinal damage and inflammation," said Dr. Timothy Denning, lead author of the study and professor and associate director of the Institute for Biomedical Sciences at Georgia State. "I think what is very intriguing about this finding is that inflammation is often viewed in the context of being bad, but it is in fact a physiologic response to damage, injury and infection. "The real key to inflammation is how to control it. In our study, we found this specific cytokine network was critical for tissue repair, but some of these same factors are being targeted in clinical trials for IBD. This entire cytokine axis is likely beneficial for host protection, but if it goes uncontrolled for too long, which is often seen in chronic diseases like IBD, they could then be pathogenic. So the key is understanding when and how to regulate these cytokines networks for the benefit of human health." Another key finding was that IL-36γinduces IL-23, linking them in the repair of acute intestinal barrier damage. In the study, mice that did not have the gene for IL-36γ or IL-36 receptor could not recover from acute intestinal damage, but treating mice with IL-23 helped the mice to resolve the damage. The study also revealed that IL-23 serves as a key intermediary betweenIL-36γ and IL-22.This shows that IL-23 can be beneficial and part of a network that is instrumental in tissue protection and intestinal barrier repair.Importantly, clinical trials that target and block IL-23 to treat Crohn's disease and ulcerative colitis, two major types of IBD, are getting promising outcomes, highlighting the importance of context-dependent effects of these factors. Therefore, one has to be cautioned against classifying this cytokine pathway as exclusively beneficial or deleterious. Instead, critical details such as where these cytokines are produced, and the level and duration of expression, are central to understanding their function, Denning said. "What we are showing is that for early stages and acute stages of disease, these factors can actually be protective, whereas others are finding that in chronic diseases, these factors can be pathogenic," Denning said. "Having a clear appreciation for that will afford the ability to manipulate these cytokines during specific phases of disease for the optimal therapeutic benefit." It is also important to understand how blocking these cytokines, which can be beneficial if they are at high levels for a long period of time, may impair repair processes, he said.